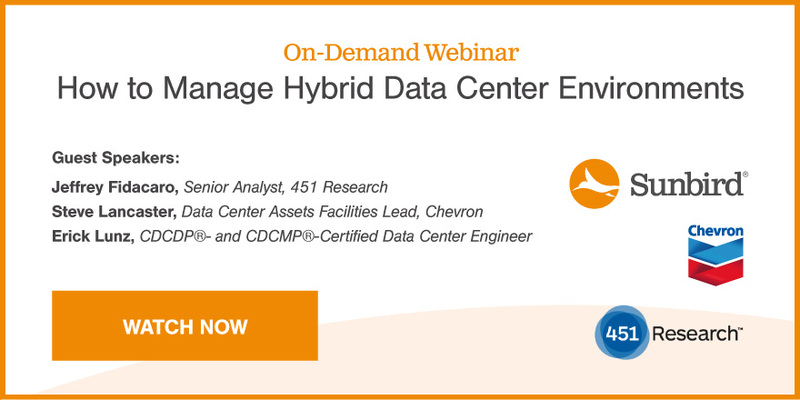 Today’s data center professionals are increasingly tasked with managing hybrid data centers. These modern data center environments combine traditional, on-premises enterprise data centers as well as off-premises data center capacities, which might include cabinets and containment areas in colocation data centers, private or public clouds, or managed services. A recent 451 Research Voice of the Enterprise: Datacenter Transformation, Budgets and Outlook survey found that 59 percent of enterprise end-user respondents owned and operated server rooms, while 57 percent utilized cloud service providers, 54 percent owned and operated their data center facilities, and 41 percent rented space from colocation data center providers. Fidacaro shared these and other insights from 451 Research during the first segment of our webinar “How to Manage Hybrid Data Center Environments.” Fidacaro opened the webinar with recent data center management research around what’s driving organizations to migrate workloads to the cloud. He also highlighted hybrid data center management challenges and how Data Center Infrastructure Management (DCIM) software can help organizations make data-driven decisions to for more effective data center capacity management. Fidacaro was joined by Steve Lancaster, Data Center Assets Facilities Lead, Chevron, and Erick Lunz, CDCDP®- and CDCMP®-Certified Data Center Engineer, who shared their experiences with the practical applications of DCIM software to hybrid data center management. Lancaster and Lunz also shared their perspectives on the current IT skills shortage in the data center industry, specifically for cloud workloads. Finally, James Cerwinski, Sunbird’s Director of Product Management, demonstrated how Sunbird’s DCIM solution can manage both virtual and physical assets. With the diverse perspectives shared during the webinar, attendees gained real-world, practical tips from experts who are living through the transition to hybrid data center management and understand how to mitigate its challenges. Read on to view the slides and our key takeaways from the webinar. 1. “Cloud-First” is not always best. By now, you’ve probably heard the phrase “cloud is king” so often that it’s easy to accept as fact—especially when it comes to data center workloads. At first glance, the data seems to support this concept. 451 Research expects that by 2019, 60 percent of workloads will run in cloud architectures. According to Fidacaro, some of the key drivers for adopting cloud computing include cost savings, on-demand resource scalability, improved availability and uptime, faster provisioning time and agility, staff savings, and improved security. At the same time, despite the shift to the cloud, 46 percent of workloads will remain on-premises, indicating that hybrid data center environments are here to stay. Cost was one of the most prevalent topics of discussion. During the webinar, Lancaster brought up cost savings as an often-cited benefit of moving to the cloud but questioned its veracity. “Knowing that cloud price has been a big deal for the push for the cloud…is it really as good a deal as these cloud hosters say?” said Lancaster. He considered this issue in the context of total cost of ownership for cloud applications. Over the past year, 34 percent of enterprises surveyed by 451 Research had migrated workloads out of a public cloud. Based on a recent 451 Research Voice of the Enterprise: Cloud Transformation, Organization Dynamics survey, the cost of the cloud being higher than expected (9.6 percent) was one of the primary drivers for repatriating workloads to a private or non-cloud environment. The only options with higher responses were performance/availability issues (19.3 percent), improvements to the on-premises cloud environment (10.8 percent), and data sovereignty regulation changes (10.8 percent). 2. Combine DCIM Software with DCSO to identify the best data center environment. If cost is not the only determining factor in deciding whether to explore a hybrid data center environment, then what is? According to Fidacaro, it depends. Finding the optimal infrastructure for a specific workload based on factors like cost, availability, and business requirements – the best execution venue process – varies by organization as well as the factors that you want to optimize for. Do you optimize for cost? Or performance? Where can you find the data you need to determine your best execution venue? The answer lies in DCIM solutions. DCIM software tools can provide visibility into data center operations and help data center professionals collect and analyze the data they need to make more informed decisions, particularly around data center capacity planning. Some of the challenges with managing hybrid data center environments include lack of end-to-end transparency across on- and off-prem assets and data center capacity planning and operations management. DCIM software can address both issues. “DCIM can reduce this complexity of managing these hybrid IT environments by enabling organizations to take more informed, data-driven decision making regarding their capacity choices,” said Fidacaro. For example, DCIM software can provide key metrics regarding your assets and display the data using out-of-the-box dashboards and reports, so you don’t need to purchase another third-party data analysis tool, such as Tableau, to derive insights from your data center information. Built-in, what-if analysis widgets enable you to model changes to your data center capacity management before they actually happen. As Cerwinski demonstrated using Sunbird’s software, a comprehensive DCIM solution can make it fast and easy to manage capacities in a hybrid environment through a single pane of glass. With better data center capacity management, you can save up to $17,500 for each cabinet that you don’t need. To maximize the value of your DCIM data, consider Data Center Service Optimization (DCSO) approaches, which enable integrating your DCIM software with other systems, such as an ITSM, VM manager, or financial database, to track metrics across your infrastructure and business. In Lunz’s experience, DCIM software is a critical enabler for effective data center management. 3. Data center skills shortage = opportunity for reinvention. As organizations develop their hybrid data center environments, they may struggle to find staff who have the skillsets to handle both cloud and non-cloud environments. Experience levels in cloud roles may also be low, given that it’s a relatively new field, and because these new hybrid data center roles require a more diverse skillset than traditional data center jobs. According to a recent 451 Research Voice of the Enterprise survey, 28.5 percent of respondents said that they were experiencing a skills shortage for data center and facilities staff. Among those respondents, 60 percent planned to address this gap by training their existing staff to learn new skills. Over 33 percent also planned to utilize contractors and consultants to expand their staff. Both Lancaster and Lunz have experienced the data center skills shortage and believe that talent development is critical to addressing it. With data centers becoming increasingly diverse, it’s more critical than ever for data center professionals to be able to handle the challenges of managing these hybrid data center environments and select the best execution venues for their organizations. Whether you are just starting to modernize your data center management, need to build your skills to stay relevant in a cloud world, or are deeply involved in your organization’s hybrid data center environments, these tips and insights from data center experts can help you maximize your value to your organization. Combine your new knowledge and skills with DCIM software or other data center monitoring tools for hybrid data center management, and you’ll be even better prepared to handle any changes to your data center in the future. Want to learn more about how DCIM software can help you make smarter, more informed decisions around your hybrid data center environments? https://attendee.gotowebinar.com/recording/1925247451388618498Watch the webinar here, and then test drive Sunbird’s DCIM software for yourself today.